This function merges exported configuration into the Server. The configuration is loaded from an XML file which can be created by the Server Configuration Export function, or automatically generated. The Import function is located in Configuration > Import. If you want to automate the process of configuration import, use the HTTP API Operation import_server_config. Select the XML file with exported configuration. 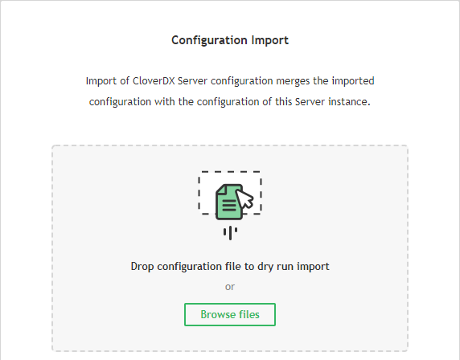 As the first step, the Server executes a safe dry run import, without actually changing your Server's configuration. Once uploaded, the Server checks the validity of the configuration and displays a dry run log containing added/updated items or errors. You will be notified if the source and target differ in at least minor version number (e.g. 4.8.1 and 4.9.0). Importing configuration from different version may generate more warnings which will require your attention. The configuration is valid: no errors have occurred and the configuration can be committed. The dry run ended with warning(s): the configuration can be committed, but the warning(s) should be resolved after import. The dry run ended with error(s): the configuration cannot be committed until the error(s) are fixed. Consult the dry run log to fix the errors in the XML file and re-upload it. Below is an example of a log entry indicating a change in the configuration where a user smithj is added to a previously empty group configuration. The diff view shows the change in two steps (two lines grouped together with no space between them) as 'replacing' the empty group ( ) with the same group with the new user ( ). Once all errors are resolved and the configuration is valid, you can Commit Changes. After confirmation, Log of committed changes will display the results. The log can be downloaded, as well. Some items may not be initialized properly after the import (e.g. their initialization requires presence of a cluster node that went down in the meantime or someone made changes on the Server between dry run and committing). User is notified about these problems in Log of committed changes with link to the affected items. You should check such items in respective sections of the Server console and change their settings to fix the issue or remove them.